Some days ago we saw a pigeon near our bird bath just sitting and not moving. From time to time it would shuffle around. Apart from that no signs of animation. 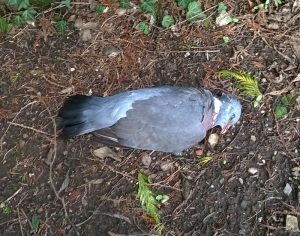 Yesterday we saw the pigeon lying on its side a few meters away from where we had seen it. It’s time had come for one reason or another. It causes me to ponder that death and life are intertwined. It’s part of the life-cycle of a death cycle. It happens to everybody. I tend to not get emotional. I’m not overly emotional anyway but I have read so much about life after death which relates to humans but I’m pragmatic about the whole thing. When my time has come I will go simple as that. Francoise will be burying the bird along with a frog, two goldfish, and anything else that else that has died in our garden. We have a small graveyard area for this purpose. Today I woke up with aching ribs as a result of my overenthusiastic attempt to lift the drain cover. If concrete is 2 inches thick, and about 2’6″ long and 2 foot wide then it is very heavy and no one should ever attempt to lift or move such a thing on their own. The whole idea about making such a substantial drain cover is that no one can get in and make a nuisance of themselves. Due to the injury I unknowingly suffered when I lifted off the man cover, I cannot put it back so it stands on its end. I hope no animals or creatures fall into it. I try to discipline myself once a day to watch a serious piece of journalism so that I can become familiar with the main issues of the day. I’m not talking about the Main Stream Media junk. I’m talking about real facts. All those still living in climate change AKA global warming do watch the article below.